Rudi’s Organic Bakery officially announced the introduction of several new products today at Natural Products Expo West. The new products include Rudi’s Organic Bakery Soft Pretzels, Rudi’s Organic Bakery Super Seeded and Sprouted Breads and a new ‘soft and fluffy’ Rudi’s Gluten-Free Sandwich Bread recipe. The new products leverage the company’s heritage of baking bread on the bright side, offering the whole family nutritious and delicious options they can enjoy throughout the day. Rudi’s Organic is pleased to announce the launch of Super Seeded and Sprouted Breads packed with plenty of healthy seeds and grains for greater nutrition and yumminess. What sets Rudi’s Organic Super Seeded and Sprouted Breads apart is that they offer super nutrition without sacrificing the flavor and soft texture of Rudi’s Organic breads the whole family has come to enjoy. The breads are available now in natural food stores and select mainstream supermarkets and will reach national distribution soon. Rudi’s Organic Super Seeded Breads are USDA Certified Organic and are jam-packed with the natural goodness of seeds and grains and none of those yucky artificial preservatives. The breads are ex-seed-ingly delicious and are packed with 4g of protein, plus 15–17g of whole grains and 2g of fiber with omega 3s. Super Seeded Bread (MSRP $5.59) - Featuring six different types of seeds in a delicious cracked wheat bread, this bread is the perfect base for a turkey sandwich, sharp cheese and veggies. Mighty Grains Bread (MSRP $5.59) – With a tasty mix of seven types of grains, including ancient grains and three types of seeds, this bread helps make the traditional ham and cheese a little more fun. Rudi’s Organic Sprouted Breads are full of sprouted wheat and have the softness customers expect in Rudi’s Organic breads. Made with 85 percent organic ingredients and packed with nutrition, these breads offer 17–19g of whole grains, 3g fiber and 5g of protein all sandwiched into only 120 calories per slice. Sprouted Multi Grain Bread (MSRP $5.59) – Filled with organic sprouted grains and kissed with clover honey, this bread makes sandwiches look tasty piled high with roast beef and sweet cherry peppers. Sprouted Honey Wheat Bread (MSRP $5.59) –Made with the perfect balance of sprouted wheat, honey and other natural and organic ingredients, this sprouted choice is the perfect base for mom’s wicked-good PB&J. 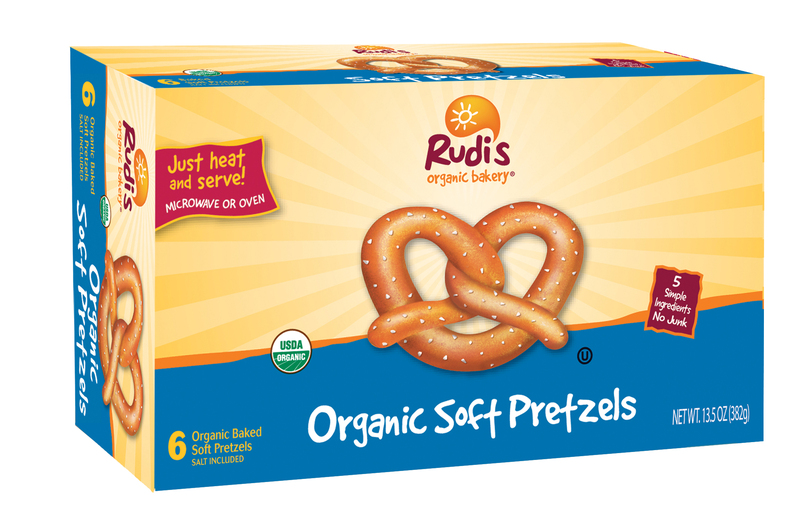 The new line of Rudi’s Organic Bakery Soft Pretzels expands the Rudi’s Organic portfolio into the snack category. Ready in a jiffy and with only 170 calories per serving, the Soft Pretzels are a convenient and nutritious solution for family snack time. The USDA Certified Organic pretzels are made with ingredients moms feel good about and are free of artificial ingredients, GMOs and high-fructose corn syrup. Rudi’s Organic Soft Pretzels will be available at natural food stores in select regions by Summer 2013. The Rudi’s Organic Plain Soft Pretzel (MSRP $4.59) – Made with just five simple ingredients and packed with 6g of protein, this option is perfect for an after school snack on its own or paired with some organic peanut butter. The Multigrain Soft Pretzel (MSRP $4.59) – Packed with 8g of whole grains and 5g of protein, these pretzels are an awesome solution to curing an afternoon craving at work. Ready to excite its gluten-free customers, Rudi’s Gluten-Free is revamping its Gluten-Free Sandwich Bread recipe full of soft and fluffy texture, incredible taste, double the fiber of the original recipe and the all-natural ingredients that Rudi’s Gluten-Free fans have come to love. In fact, the new ‘soft and fluffy’ recipe was selected as the favorite bread against a top competitor when it came to flavor, aftertaste, texture, appearance and everyday usability. Fans can enjoy the new Sandwich Bread recipe now at natural foods stores and select mainstream supermarkets across the country. Retailers can learn more about the new product launches and the variety of marketing programs Rudi’s Organic has scheduled for 2013 by visiting the Rudi’s Organic booth #3448 in Hall D at the Anaheim Convention Center during Natural Products Expo West. Rudi’s will also surprise and delight at Expo with a twist on its Missing Soft & Fluffy campaign where attendees can enter to win a $500 sweepstakes prize at the Rudi’s booth. Rudi’s Organic and Gluten-Free products are available nationally at natural foods stores and select mainstream supermarkets. To learn more and check for local product availability, visit rudisbakery.com.